Thanks to the Bloomberg New Energy Finance website, we came across some interesting news; something we've known about for years but not much has been done to bring it to life in the "mainstream" media. Well they have created a report complied a "...database of more than 100,000 deal and project records collected and maintained by over 100 analysts and researchers based in 15 locations worldwide"
The main purpose and goal of this is to be able to track the transactions made by leading industry tycoons and be able to regurgitate that information as a trend once it emerges as such. When we're talking about clean energy, we mean when a large brand takes steps to make their business or factories more energy efficient using solar energy, wind energy, energy smart technology or others than fall into saving energy. 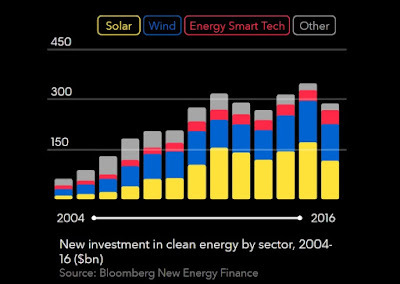 For example, last year 2016, companies invested in solar and wind energy equally and energy smart technology the least. Sadly in total in 2015 there were 348.5 billion dollars worth of investments compared to 2016 which only showed 287.5 billion dollars in investments. So either more companies were interested in doing in 2015 than 2016 or the issue isn't a issue any longer for most companies to care to convert over. Bloomberg states that the cost of investing in clean energy isn't as expensive as it was in the previous years; I guess it's because more and more people are learning that it doesn't take a genius to use the wind or sun as a source of energy (it's been around for years guys). Many people know how it's the converting to stop using the negative gases or energy that people want it now instead of saving for later. I think since they stated China and Japan didn't spend nearly quite as much as of in 2016 is because they have ALREADY BEEN DOING IT so why would they need to continually invest in something they've been doing for years now. We've done damage for years and years and now America is trying to catch up and change things since it's getting worst by the minute. Had we pay attention to this in 2006, ten years ago maybe the billions of dollars now being spent wouldn't be so drastic. 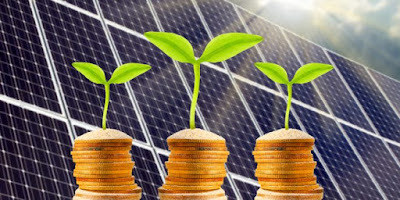 Luckily now that the money is being spent in the right places on renewable, solar, and wind energy we can actually have something to look forward to in the years to come. The wave is catching on and capturing the eyes of the right people and companies. As always we'd love to hear from you. Got an opinion on this topic? Comment below! What do think about all this? We'd hear you out! We're here to help you live better and conserve energy for years to come. Whether that's showing you how to save money on your bills by conserving energy, giving you tips on how to turn your home green, or tricks on installation of a product you've purchased from us, we're always here!